Star Trek Beyond is a 2016 American space opera film directed by Justin Lin and written by Simon Pegg and Doug Jung, based on the television series Star Trek created by Gene Roddenberry. It is the thirteenth film in the Star Trek film franchise and the third and final installment in the reboot series, following Star Trek (2009) and Star Trek Into Darkness (2013). Chris Pine and Zachary Quinto reprise their respective roles as Captain James T. Kirk and Commander Spock, with Pegg, Karl Urban, Zoe Saldana, John Cho, and Anton Yelchin reprising their roles from the previous films. This was one of Yelchin's last films before his death in June 2016. Idris Elba, Sofia Boutella, Joe Taslim, and Lydia Wilson also appear. Principal photography began in Vancouver on June 25, 2015. The film premiered in Sydney on July 7, 2016, and was released in the United States on July 22, 2016, by Paramount Pictures. The film is dedicated to the memory of Yelchin, as well as to actor Leonard Nimoy, who died during pre-production. 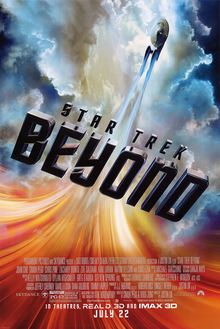 The film grossed $343.5 million at the box office, and received generally positive reviews with praise for its acting, action sequences, musical score, visual effects, and tributes to Yelchin and Nimoy. At the 89th Academy Awards, the film was nominated for Best Makeup and Hairstyling, but lost to Suicide Squad. Three years into its mission, the USS Enterprise arrives at Yorktown, a massive space station, for resupply and shore leave for its crew. Struggling to find meaning in their endless exploration, Captain James T. Kirk has applied for a promotion to vice admiral; he recommends Spock as his replacement. Meanwhile, Hikaru Sulu reunites with his family, Montgomery Scott works to keep the ship operational, and Spock and Nyota Uhura amicably end their relationship; Spock also receives word from New Vulcan that Ambassador Spock, his counterpart from the original timeline, has died. The Enterprise is sent on a rescue mission after an escape pod drifts out of a nearby uncharted nebula. Its occupant, Kalara, claims her ship is stranded on Altamid, a planet in the nebula. As the Enterprise exits an asteroid field within the nebula, a massive swarm of small ships ambushes and quickly overwhelms the starship, severing the ship's warp nacelles in a matter of seconds. The swarm's leader, Krall, and his crew board the crippled Enterprise, capture and kill many crew members, and recover a relic, the Abronath, that Kirk had recently obtained. Scotty manages to restore enough power for the ship to attempt to flee, but Krall orders his swarm to destroy the Enterprise, and they smash the ship in half. Kirk, having recovered the Abronath, orders the crew to abandon ship, leaving the remains of the Enterprise to crash on Altamid. On the planet, Krall captures Sulu, Uhura and other survivors. Kirk and Pavel Chekov, accompanied by Kalara, locate the Enterprise's saucer section. Realising that Kalara knew they would be attacked, they trick her into revealing herself as Krall's spy. To escape Krall's soldiers, Kirk and Chekov use the ship's thrusters to flip the saucer over, and Kalara is killed in the maneuver. Elsewhere on the planet, Dr. Leonard McCoy and a wounded Spock search for other survivors. Spock explains to McCoy that the tension he witnessed between him and Uhura at Yorktown was due to his intention to leave Starfleet to help the Vulcan survivors, and continue the late Ambassador Spock's work. Jaylah, a scavenger who previously escaped Krall's encampment where her father was killed, rescues Scott and takes him to her makeshift home, the grounded USS Franklin, an early Starfleet vessel reported missing over a century earlier. Scott is reunited with Kirk, Chekov, McCoy and Spock. Threatening to kill the crew, Krall coerces Ensign Syl to hand over the Abronath that she had concealed for Kirk, then uses it on her to demonstrate an ancient bioweapon that can disintegrate any humanoid. With the device complete, Krall intends to kill Yorktown's inhabitants, then use the base to attack the Federation. Kirk and the others free the crew as Krall launches into space with the bioweapon, leading his drones to Yorktown. As the Enterprise survivors power up the Franklin and launch her in pursuit of Krall, they deduce that such a massive swarm must coordinate its attacks via radio signals, specifically in the VHF frequency band. Scott transports Spock and McCoy into one of the swarm ships to seize control of it. Matching the swarm's frequency, they jam and disorient the swarm by broadcasting the 1994 song "Sabotage" by the Beastie Boys, destroying almost the entire fleet. Krall and his three surviving ships, one of which contains Spock and McCoy, are chased by the Franklin through Yorktown. The chase ends at the station's headquarters, where the Franklin's sudden appearance causes the three ships to smash into it. As Krall flees into the starbase, Uhura and Kirk discover from the Franklin's logs that he is actually Balthazar Edison, former captain of the Franklin. A pre-Federation human soldier, Edison rejected the Federation's principles of unity and cooperation with former enemies like the Xindi and the Romulans. When he and his crew were stranded on Altamid by a wormhole, the three survivors used the extinct natives' technology to prolong their lives at the cost of the others, and re-purposed the ancient race's dormant drone workers into the swarm. Thinking the Federation had abandoned them, Edison planned to destroy the Federation and resume galactic conflict. Kirk pursues Edison into Yorktown's ventilation system, where Edison activates the bioweapon. Before it can spread, Kirk ejects it and Edison into space, where the weapon kills Edison. Using the alien ship they commandeered, Spock and McCoy save Kirk moments before he is also blown into space. In the aftermath, Commodore Paris closes the files of Captain Edison and the USS Franklin crew. Kirk decides to keep his position as the Enterprise's captain; Spock chooses to remain in Starfleet, and begins to renew his relationship with Uhura. On Kirk's recommendation, Jaylah is accepted into Starfleet Academy. As the crew celebrates Kirk's birthday, they watch the construction of their new ship, the USS Enterprise-A—and when the ship is completed, they resume their mission. The film pays tribute to Leonard Nimoy and Anton Yelchin, both of whom died before the film's release. Jeff Bezos appears as an alien Starfleet crew member. Leonard Nimoy appears in two photo cameos as Spock Prime – individually, and alongside George Takei, Walter Koenig, William Shatner, James Doohan, DeForest Kelley, and Nichelle Nichols as the Prime versions of Sulu, Chekov, Kirk, Scott, McCoy, and Uhura, respectively. Abrams returned only as a producer so he could focus on directing Star Wars: The Force Awakens. Writer-producer Roberto Orci was announced as director in May 2014. He would have been making his directorial debut. However, in December, Orci's role was also listed as a producer only, with Edgar Wright considered to replace him as director, along with a shortlist of others, including Rupert Wyatt, Morten Tyldum, Daniel Espinosa, Justin Lin and Duncan Jones. Also, Star Trek actor and director Jonathan Frakes expressed interest in the job. At the end of the month, Lin was announced as director of the third installment. In 2013, Orci had begun writing the script with Patrick McKay and J. D. Payne, with Payne saying of the script in March, "We really want to get back to the sense of exploration and wonder. The kind of optimistic sense of the future that Star Trek has always kind of had at its core. It's the Chicago Bulls in space, in terms of these people who are all awesome at their job." In January 2015, after Orci's departure as director, Simon Pegg and Doug Jung were hired to rewrite the screenplay, with Pegg saying on the previous draft, Paramount "had a script for Star Trek that wasn't really working for them. I think the studio was worried that it might have been a little bit too Star Trek-y." Pegg had been asked to make the new film "more inclusive", stating that the solution was to "make a western or a thriller or a heist movie, then populate that with Star Trek characters so it's more inclusive to an audience that might be a little bit reticent." The first film's major cast members signed on for two sequels as part of their original deals. In 2014, early in the film's development, William Shatner said that he was contacted by producer Abrams to see if he would be interested in a possible role, but as the process continued and the script changed hands, the role never materialized. Alice Eve was not included in the film despite her character having joined the Enterprise crew at the end of the last installment, because Pegg, in writing the script, did not have anything meaningful for her to do; however, he stressed that Eve could appear in a later installment. Joseph Gatt's cyborg Science Officer 0718 was dropped from the film after a rewrite. In March 2015, Idris Elba was in early talks to play the villain, and he was confirmed for the role in the following months. Pegg noted that the villain would be an original one, rather than a known antagonist from past stories in the Star Trek franchise. In April, Sofia Boutella joined the cast in a lead role, and in early July, Deep Roy was confirmed to reprise his role of Keenser. That month, Joe Taslim was added to the cast opposite Elba's villain, and by August, Lydia Wilson joined as well. In March 2016, Shohreh Aghdashloo was cast as Admiral Paris for reshoots on the film. Principal photography on the film began on June 25, 2015, in Vancouver, and Squamish, British Columbia, after several delays caused by multiple script rejections. Additional filming locations were Seoul, South Korea, and Dubai, United Arab Emirates. Principal filming ended on October 15, 2015. In March 2016, production underwent reshoots, with Aghdashloo added to the cast. In August 2015, composer Michael Giacchino confirmed that he would return to write the score. On June 26, 2016, singer Rihanna released a teaser across her social media accounts for a single for the film entitled "Sledgehammer", and the song premiered the following day. The Beastie Boys' "Sabotage" was used in the movie's trailer, as well as the final battle scene. The film was released in 2D, RealD3D, IMAX 3D and Barco Escape. In August 2014, it was announced that Paramount had pushed back the release of the film to 2016, for the 50th anniversary celebration of the debut of Gene Roddenberry's original sci-fi series. In December, it was announced that the film was to be released on July 8, 2016. In September 2015, the film's release date was pushed back to July 22, 2016. The film was released in Dolby Cinema format in selected theaters. The film had its Australian premiere in Sydney on July 7. A teaser trailer for the film was released on December 14, 2015, and was criticized by some fans for focusing too much on action, and for featuring the Beastie Boys song "Sabotage", which many considered out of place, despite its use in the first film of the rebooted series. Pegg expressed similar thoughts of dissatisfaction with the teaser, saying that he "didn't love it" because "I know there's a lot more to the film." He interpreted the trailer to be a way of the marketing team saying, "Come and see this movie! It's full of action and fun!" A second trailer was released on May 20, 2016, to warmer reviews. A third and final trailer was released on June 27, 2016, featuring Rihanna's single "Sledgehammer". Star Trek Beyond was released on Digital HD on October 4, 2016, and on Blu-ray and DVD on November 1, 2016. Star Trek Beyond underperformed financially at the box office. Scott Mendelson of Forbes observed that one factor contributing to the film's underperformance was its untimely release in a crowded summer in which it was surrounded by other films like Ghostbusters, Jason Bourne and Suicide Squad. 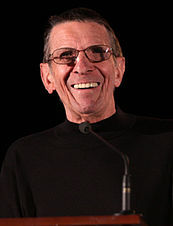 He also noted that had Paramount released the film for the Star Trek's 50th anniversary on September 8, the film could have benefited from that occasion, as demonstrated in October 2012 when MGM released the James Bond film Skyfall (which went on to gross over $1 billion) for that series' 50th anniversary. Star Trek Beyond grossed $158.8 million in the United States and Canada and $184.6 million in other countries for a worldwide total of $343.5 million, against a production budget of $185 million. It had a global opening of $89.2 million and an IMAX opening of $11.6 million on 571 IMAX screens. Industry analyst Danny Cox had previously estimated that in order for the film to break even, it would have to earn $340–350 million worldwide, and ended losing an estimated $50.5 million. In the United States and Canada, the film was projected to gross $50–60 million from 3,928 theaters in its opening weekend. It opened alongside Ice Age: Collision Course and Lights Out, but critics noted that the film did not face any direct competition with them. It opened across 3,928 theaters, of which 391 were IMAX. It made $5.5 million from Thursday previews from 3,100 theaters, an improvement over its two immediate predecessors. Of that, the film grossed $1.1 million on 387 IMAX screens. This includes revenues generated from Wednesday night, when Paramount screened all Star Trek films, which concluded with a 10pm screening of Beyond. On its opening day, it earned $22.5 million, which is the second-biggest among the franchise, only behind Star Trek ($30.9 million), the third-biggest opening day of the summer for a live-action film and the second-biggest opening day of the year for a non-comic book superhero live-action film, behind only The Jungle Book. It earned $59.3 million in its opening weekend, which is the third-biggest debut among the franchise but the lowest of the reboot series (behind Star Trek and Star Trek Into Darkness for both). Adjusted for inflation, it ranks fourth behind the aforementioned films and Star Trek: First Contact ($60 million). It performed exceptionally well in IMAX making $8.7 million in 387 IMAX screens. The film came in 14% lower than the opening of its immediate predecessor, Star Trek Into Darkness, but box office experts noted that the fall was mild in comparison to other sequels of 2016 and is still considered a hit. It dropped precipitously by 69% on its second Friday and was overtaken by newcomer spy film Jason Bourne, earning $6.75 million. By comparison, Star Trek dropped 56% on its first Friday while Star Trek into Darkness fell 53%. However, this was not the worst Friday-to-Friday drop for a Star Trek film, as Star Trek: Nemesis plunged 83% on its second Friday due to negative word-of-mouth and heavy competition from The Lord of the Rings: The Two Towers. By the second and third weekend following the film's release, box office revenue continued to drop significantly due to the release of competing films like Jason Bourne and Suicide Squad. Internationally, the film received a scattered release pattern and was released across approximately 76 markets. It opened in 37 markets in conjunction with its North American release in its first weekend, including in the United Kingdom, Germany and Australia — territories where the franchise has traditionally performed well. It earned a total of $30 million from the said number of markets which is slightly lower than Star Trek Into Darkness' $31.7 million international debut in 2013. Paramount said that the heatwave in Europe negatively impacted the weekend's results. Beyond debuted at first place in 16 of them and recorded the biggest opening weekend ever for the franchise in 17 markets, including Russia, Taiwan and Thailand. It debuted in third place overall at the international box office, behind Skiptrace and The Legend of Tarzan. Beyond set numerous records in IMAX theaters. Led by very strong results in the UK and Russia, it grossed an estimated weekend of $3.2 million on 184 screens besting Star Trek Into Darkness' $2.8 million debut. In its second weekend, it fell drastically by 57% earning $13 million. As a result, it slipped into sixth place at the box office. After fluctuating up and down the charts, it finally topped the international box office in its seventh weekend due to a robust debut in China and remained at the top for the second weekend in a row. The highest international tallies were recorded in the United Kingdom, Ireland and Malta ($6.1 million), South Korea ($5.6 million), Germany ($4.5 million), Russia and the CIS ($3.3 million), Australia ($3 million), France ($2.1 million), Mexico ($1.5 million), Brazil ($1.6 million), Venezuela ($1.4 million) and Taiwan ($1 million). In the United Kingdom, where the performance of the franchise has been consistently solid, it was edged out by the family film The BFG. Its £4.74 million ($6.2 million) opening from 535 theaters is the lowest among the rebooted series and a 31% decline from the £8.43 million ($11 million) opening posted by Star Trek Into Darkness, if previews are deducted. The Guardian cited J. J. Abrams' departure as the director and fans' unenthusiastic response to Idris Elba as the villain (in comparison to Benedict Cumberbatch in Star Trek Into Darkness) as some possible reasons why the film failed to generate lucrative revenue. The site also projected a total gross of around £20 million ($26 million+) for the film. It opened in China on September 2, and earned an estimated $9.30 million on its opening day (representing 66% of the total marketplace), including $370,000 in midnight preview showings which is 160% larger than the opening day of Star Trek Into Darkness and $21.8 million in two days. In total, it had an opening weekend of $31.3 million (per Paramount) and $30.7 million (according to Chinese box office service Ent Group) from 6,259 screens, marking the biggest Star Trek debut in country which is 105% bigger than the opening of Star Trek Into Darkness. It was the only one of five new releases to make any impression on the chart. It remained at the top of the box office for a second weekend by adding another $10.1 million (according to Chinese data provider Ent Group), or $11.37 million (according to Paramount) from 5,830 locations from Friday to Sunday, a steep decline of 62.6% from its previous weekend. It fell out of the top 10 in its third weekend, and has grossed a total of $64.2 million there. It is projected the film will end its run there anywhere around $70–100 million, a disappointing figure considering the robust marketing effort by investors Alibaba Pictures and Huahua Media. Thus, the film is the second Paramount film to underperform in that corner following Teenage Mutant Ninja Turtles: Out of the Shadows in July. In terms of total earnings, its biggest offshore markets are the United Kingdom ($13.3 million), Germany ($8.6 million), Russia and the CIS ($5.5 million) and Australia ($5.2 million). Star Trek Beyond opened in Japan on October 21, where it has earned $4.9 million as of 17 November 2016. On Rotten Tomatoes, the film has an approval rating of 85% based on 288 reviews, with an average rating of 7/10. The website's critical consensus reads, "Star Trek Beyond continues the franchise's post-reboot hot streak with an epic sci-fi adventure that honors the series' sci-fi roots without skimping on the blockbuster action." On Metacritic, the film has a score of 68 out of 100, based on 50 critics, indicating "generally favorable reviews". Audiences polled by CinemaScore gave the film an average grade of "A–" on an A+ to F scale, down from the first two films' "A". Richard Roeper of the Chicago Sun-Times gave the film 3 stars out of 4 and said, "Even with its big-screen pyrotechnics and its feature-length running time, Star Trek Beyond plays like an extended version of one of the better episodes from the original series, and I mean that in the best possible way." Scott Collura of IGN awarded the film 8.4/10, describing it as being: "terrific, a fun and exciting entry in the series that balances subtle fan service while also feeling fresh and modern; Star Trek Beyond is the perfect way to celebrate the series’ 50th anniversary." David Rooney of The Hollywood Reporter said the screenplay by Simon Pegg and Doug Jung "injects a welcome strain of humor that's true to the original Gene Roddenberry creation, delivering nostalgia without stiff veneration", and went on by saying, "While Beyond won't unseat 1982's thrilling The Wrath of Khan as the gold standard for Star Trek movies, it's a highly entertaining entry guaranteed to give the franchise continuing life." Owen Gleiberman of Variety, in an otherwise positive review, described the film being: "a very familiar, old-fangled, no-mystery structure, and that’s because it’s basically the Star Trek version of an interplanetary action film, with a plot that doesn’t take you to many new frontiers." Furthermore, he called Star Trek Beyond "a somewhat diverting place holder, but one hopes that the next Star Trek movie will have what it takes to boldly go where no Star Trek movie has gone before." Mark Hugues of Forbes said, "Star Trek Beyond is the third-best Star Trek film of all time, creating the sort of emotional connection and familiar, powerful characterizations we loved in the original series while delivering top-notch action and the best Star Trek movie villain since First Contact's Borg Queen." Despite its international success, Star Trek Beyond was met by critics who were less taken with the film. Kyle Smith of the New York Post gave the film 1½ stars out of 4 and he commented that the filmmakers "should have called it Star Trek Into Drowsiness." Smith later added, "Beyond is tepid when it’s trying to be emotional, moronic when it’s trying to be thrilling and unfunny when it’s trying to be non-unfunny. It lacks a storytelling module: Things just click into place when needed, as when Kirk commands Scotty to rev up a busted old spaceship, Scott says it’s impossible, and 14 seconds later everything is ready to rip." James Berardinelli of Reelviews gave 2½ stars out of 4, writing: "Star Trek Beyond is a Star Trek movie, although not an especially good one; The action sequences are frenetic, kinetic, and at times incoherent. This isn’t unexpected; it’s Lin’s trademark. But the plot, credited to Simon Pegg & Doug Jung, is pure Trek. Unfortunately, it’s also instantly forgettable." Dave Robinson of outlet Crash Landed writes that "Star Trek Beyond fails to push beyond its own roots and becomes just another very safe sci-fi popcorn movie in an increasingly crowded market, that will likely have you leaving the theatre feeling exactly as you entered." Chris Nashawaty of Entertainment Weekly gave the film a C+ and wrote, "[w]ith Beyond, it feels like just another summer tentpole with not enough going on underneath the tent." Pine and Quinto had signed contracts to return as Kirk and Spock for a fourth film should one be made. In July 2016, Abrams confirmed plans for a fourth film and stated that Chris Hemsworth would return as Kirk's father, George, whom he played in the prologue of the first film. Later that month, Paramount confirmed the return of Hemsworth, as well as most of the Beyond cast, producers Abrams and Lindsey Weber, and writers J. D. Payne and Patrick McKay. That same month, Abrams said that Chekov would not be recast, after Anton Yelchin died in an accident outside his residence in California. In December 2017, it was revealed that Quentin Tarantino had pitched an idea for a potential Star Trek film to Abrams and Paramount, who were reportedly enthusiastic about the idea. Tarantino was mentioned as a possibility to direct the film if his schedule allowed, and that Abrams and Paramount would attempt to assemble a writer's room to explore the concept. On December 22, writer Mark L. Smith was hired by Paramount and Bad Robot to write a screenplay based on Tarantino's original pitch, with Tarantino still expected to direct. In April 2018, it was announced that two new Star Trek films were in development at Paramount. Later that month, it was announced that S. J. Clarkson would direct the second Star Trek film in development, and that the film would enter production before Tarantino's film. J. D. Payne and Patrick McKay would co-write the screenplay, while Abrams and Lindsey Weber would co-produce the project. In August 2018, however, Pine and Hemsworth walked away from negotiations to star in the film after refusing to take pay cuts as a result of Star Trek Beyond's underperformance at the domestic box office. In January 2019, Paramount reportedly cancelled development of the fourth installment. ^ "Star Trek Beyond [2D] (12A)". British Board of Film Classification. July 13, 2016. Archived from the original on August 20, 2016. Retrieved July 13, 2016. ^ a b c "Star Trek Beyond (2016)". Box Office Mojo. Archived from the original on August 23, 2016. Retrieved November 17, 2016. ^ Lang, Brent; Stedman, Alex (June 19, 2016). "'Star Trek' Actor Anton Yelchin Dies at 27". Variety.com. Archived from the original on December 17, 2017. Retrieved December 11, 2017. ^ "Star Trek Anton Yelchin Role Will Not Be Recast". July 19, 2016. ^ a b Lin, Justin (April 6, 2016). "Who were the STAR TREK BEYOND aliens?". YOMYOMF. Archived from the original on June 11, 2016. Retrieved June 1, 2016. ^ Kottasova, Ivana (July 18, 2016). "Jeff Bezos plays an alien in the latest Star Trek movie". CNNMoney. Archived from the original on September 17, 2016. Retrieved September 6, 2016. ^ "J.J. Abrams and Simon Pegg Talk STAR TREK INTO DARKNESS on Blu-ray and Behind-the-Scenes Footage, Plus STAR TREK 3 and Its New Director". Collider.com. November 20, 2013. Archived from the original on November 7, 2015. Retrieved June 6, 2014. ^ Sepinwall, Alan (September 11, 2013). "Watch: J.J. Abrams: Rupert Wyatt would be great for 'Star Trek 3'". Hitfix.com. Archived from the original on June 6, 2014. Retrieved June 6, 2014. ^ Fleming, Mike (November 2, 2013). "'Attack The Block's Joe Cornish Beaming Up For 'Star Trek 3?'". Deadline Hollywood. Penske Media Corporation. Archived from the original on May 19, 2014. Retrieved June 6, 2014. ^ "'Star Trek 3' Beams Up Trio of Writers". The Hollywood Reporter. Prometheus Global Media. December 6, 2013. Archived from the original on May 19, 2014. Retrieved June 11, 2014. ^ "Alex Kurtzman & Roberto Orci Splitting Up on Bigscreen (EXCLUSIVE)". Variety. April 22, 2014. Archived from the original on April 23, 2014. Retrieved April 22, 2014. ^ Fleming, Mike Jr. (May 9, 2014). "Roberto Orci Frontrunner To Helm 'Star Trek 3′". Deadline Hollywood. Penske Media Corporation. Archived from the original on May 11, 2014. Retrieved May 9, 2014. ^ Kroll, Justin (May 13, 2014). "Roberto Orci to Direct 'Star Trek 3′ (EXCLUSIVE)". Variety. Penske Media Corporation. Archived from the original on May 14, 2014. Retrieved May 13, 2014. ^ Iacovino, Kayla (December 22, 2014). "'Fast and Furious 6' Director Justin Lin To Direct Star Trek 3". Trek Movies. Archived from the original on December 28, 2014. Retrieved January 22, 2015. ^ Fleming Jr, Mike (December 5, 2014). "Roberto Orci Beaming Off 'Star Trek' As Director". Deadline Hollywood. Archived from the original on December 6, 2014. Retrieved December 6, 2014. ^ Harger, Charlie (December 10, 2014). "Bring in Riker? Jonathan Frakes wants to direct 'Star Trek 3'". komonews.com. Archived from the original on December 16, 2014. Retrieved December 12, 2014. ^ Mile Fleming Jr (December 22, 2014). "Star Trek 3's New Director Will Be 'Fast & Furious 6' Helmer Justin Lin". Deadline Hollywood. Penske Media Corporation. Archived from the original on December 23, 2014. Retrieved December 13, 2014. ^ "'Star Trek new screenwriters', 'Star Trek 50th anniversary". Comingsoon.net. December 6, 2013. Archived from the original on October 6, 2014. Retrieved June 11, 2014. ^ "'Star Trek 3' Recruits Writers to Join Roberto Orci". Variety. Penske Media Corporation. Archived from the original on December 24, 2017. Retrieved December 11, 2017. ^ "Writer J.D. Payne Talks Star Trek 3". TrekCore/YouTube. March 18, 2014. Retrieved March 18, 2016. ^ "Simon Pegg and 'Dark Blue' Co-Creator Doug Jung to Write 'Star Trek 3'". The Hollywood Reporter. Prometheus Global Media. January 21, 2015. Archived from the original on September 24, 2015. Retrieved August 20, 2015. ^ "Simon Pegg criticises 'dumbing down' of cinema". The Guardian. May 19, 2015. Archived from the original on January 3, 2017. Retrieved December 13, 2016. ^ Pascale, Anthony (April 6, 2008). "Paramount Already Thinking About Sequel To Abrams Star Trek". TrekMovie.com. Archived from the original on September 5, 2015. Retrieved August 21, 2015. ^ "William Shatner Confirms He Was Contacted About Star Trek 3 And He Would Love To Do It". comicbook.com. September 27, 2014. Archived from the original on October 11, 2015. Retrieved October 7, 2014. ^ "William Shatner Won't Return As Kirk In Star Trek Beyond". Yahoo News. Archived from the original on February 14, 2017. Retrieved January 6, 2016. ^ Holmes, Adam (August 3, 2016). "Why Star Trek Beyond didn't Include Carol Marcus". Archived from the original on August 5, 2016. Retrieved August 3, 2016. ^ Moorhouse, Jim. "Joe Gatt Won't Be Aboard for STAR TREK BEYOND - TrekCore Blog". trekcore.com. Archived from the original on December 22, 2016. Retrieved December 2, 2016. ^ Kroll, Justin (March 25, 2015). "Idris Elba Eyed for Villain Role in 'Star Trek 3' (EXCLUSIVE)". Variety. Penske Media Corporation. Archived from the original on April 4, 2015. Retrieved April 5, 2015. ^ Brown, Brigid (September 30, 2015). "Idris Elba Drops 'Star Trek Beyond' Hints". BBCAmerica.com. Archived from the original on October 5, 2015. Retrieved October 12, 2015. ^ Bell, Crystal (September 25, 2015). "Idris Elba Promises 'Groundbreaking' Villain In 'Star Trek Beyond.'". MTV.com. Archived from the original on September 29, 2015. Retrieved October 12, 2015. ^ Fleming Jr, Mike (April 10, 2015). "'Kingsman's Sofia Boutella Lands Lead In 'Star Trek 3'". Deadline Hollywood. Penske Media Corporation. Archived from the original on April 12, 2015. Retrieved April 11, 2015. ^ "Deep Roy is On Board for STAR TREK BEYOND". TrekCore. July 10, 2015. Archived from the original on July 12, 2015. Retrieved July 10, 2015. ^ Kit, Borys (July 24, 2015). "'Fast & Furious 6' Martial Arts Actor Joins 'Star Trek 3' (Exclusive)". The Hollywood Reporter. Prometheus Global Media. Archived from the original on July 27, 2015. Retrieved July 25, 2015. ^ Kroll, Justin (August 18, 2015). "'About Time' Actress Lydia Wilson Joins 'Star Trek Beyond' (Exclusive)". Variety. Penske Media Corporation. Archived from the original on October 9, 2017. Retrieved December 11, 2017. ^ a b Busch, Anita (March 11, 2016). "Shohreh Aghdashloo Has Boarded 'Star Trek Beyond'". Deadline Hollywood. Archived from the original on March 12, 2016. Retrieved March 11, 2016. ^ Pascale, Anthony (October 1, 2014). "Star Trek 2016 To Shoot Primarily In Vancouver – Enterprise Sets To Be Rebuilt". trekmovie.com. Archived from the original on October 16, 2014. Retrieved October 7, 2014. ^ Pena, Azalea (August 28, 2014). "'Star Trek 3' movie release date set for 2016; Filming starts 2015". christiantoday.com. Retrieved September 5, 2014. ^ Evry, Max (June 25, 2015). "Filming Begins on Star Trek 3 at the Squamish Boulders in British Columbia". comingsoon.net. Archived from the original on June 27, 2015. Retrieved June 25, 2015. ^ Brown, Scott (June 25, 2015). "Star Trek 3 starts filming in Vancouver, Squamish". vancouversun.com. Archived from the original on June 28, 2015. Retrieved June 26, 2015. ^ Drew, Brian (June 25, 2015). "Star Trek Beyond Begins Production With Outdoor Shoot". trekmovie.com. Archived from the original on June 26, 2015. Retrieved June 26, 2015. ^ Drew, Brian (September 30, 2014). "Mayor: Portion Of Star Trek 2016 To Be Shot In Seoul, S. Korea". trekmovie.com. Archived from the original on October 7, 2014. Retrieved October 7, 2014. ^ Newbould, Chris (July 2, 2015). "Producers confirm Star Trek Beyond will be filmed in Dubai". thenational.ae. Archived from the original on July 3, 2015. Retrieved July 2, 2015. ^ Giacchino announced his return at an appearance at Wolf Trap in Vienna, Virginia on August 1, 2015. ^ DONGUINES, ARVIN (August 10, 2014). "'Star Trek 3' Release Date Delay News: Sequel Pushed Back Past 2015?". christianpost.com. Archived from the original on August 13, 2014. Retrieved August 30, 2014. ^ Moser, Cassidee (December 23, 2014). "Star Trek 3 Release Date Set For July 2016". IGN. Archived from the original on January 7, 2015. Retrieved January 22, 2015. ^ McNary, Dave (September 17, 2015). "'Star Trek: Beyond' Gets New Release Date". variety.com. Archived from the original on September 20, 2015. Retrieved September 18, 2015. ^ Carolyn Giardina (November 16, 2015). "'Star Wars' Dolby Cinema Release Could Push Forward the New Format". The Hollywood Reporter. Archived from the original on November 17, 2015. Retrieved November 17, 2015. ^ "Beyond Cast Attends Australia Premiere". Startrek.com. Archived from the original on July 9, 2016. Retrieved July 9, 2016. ^ Schaefer, Sandy (December 14, 2015). "Star Trek Beyond Teaser Trailer: Find Hope in the Impossible". ScreenRant.com. Archived from the original on January 12, 2016. Retrieved January 9, 2016. ^ Barnes, Henry (December 18, 2015). "Simon Pegg Joins Criticism of Star Trek Beyond Trailer". TheGuardian.com. Archived from the original on January 9, 2016. Retrieved January 9, 2016. ^ Mendelson, Scott (May 21, 2016). "The Sweeping New 'Star Trek Beyond' Trailer Is One For The Trekkers". Forbes.com. Archived from the original on August 27, 2016. Retrieved July 30, 2016. ^ Rawden, Jessica. "New DVD Releases: When To Buy The Latest Movies In October 2016". Cinema Blend. Archived from the original on September 30, 2016. Retrieved October 4, 2016. ^ "Star Trek Beyond (2016)". DVD Release Dates. Archived from the original on September 23, 2016. Retrieved September 21, 2016. ^ "Skyfall (2012)". Box Office Mojo. Archived from the original on January 6, 2013. Retrieved September 9, 2016. ^ Scott Mendelson (September 8, 2016). "'Star Trek Beyond' Should Have Opened Today, On The 50th Anniversary". Forbes. Archived from the original on September 9, 2016. Retrieved September 9, 2016. ^ Scott Mendelson (August 23, 2016). "Box Office: The Big Bombs And Bigger Disappointments Of The Summer". Forbes. Archived from the original on August 30, 2016. Retrieved September 9, 2016. ^ a b c d e f Anita Busch (July 25, 2016). "'Star Trek Beyond' $30M Debut; 'Lights Out' $8.5M; Jackie Chan's 'Skiptrace' Nails $64M Bow – Int'l Box Office Final". Deadline Hollywood. Archived from the original on July 26, 2016. Retrieved July 26, 2016. ^ "Star Trek Beyond': Reasons It Failed, The End Of The Franchise - Why Is No-One Going to See It?". Inquisitr. August 15, 2016. Archived from the original on August 21, 2016. Retrieved August 21, 2016. ^ "Can 'War For The Planet Of The Apes' Conquer The Summertime Franchise Blues? – Advance B.O. Forecast". Deadline Hollywood. July 4, 2017. Archived from the original on July 5, 2017. Retrieved July 5, 2017. ^ "'Star Trek Beyond' To Blast Off Fueled By Comic-Con World Premiere – Box Office Preview". Deadline Hollywood. July 19, 2016. Archived from the original on July 20, 2016. Retrieved July 19, 2016. ^ Pamela McClintock (July 20, 2016). "Box-Office Preview: 'Star Trek Beyond' Targets $55M-$60M Bow". The Hollywood Reporter. Archived from the original on July 20, 2016. Retrieved July 21, 2016. ^ a b Anthony D'Alessandro (July 19, 2016). "'Star Trek Beyond' To Blast Off Fueled By Comic-Con World Premiere – Box Office Preview". Deadline Hollywood. Archived from the original on July 21, 2016. Retrieved July 21, 2016. ^ Rebecca Ford (July 22, 2016). "Box Office: 'Star Trek Beyond' Blasts Off to $5.5 Million Thursday". The Hollywood Reporter. Archived from the original on August 14, 2017. Retrieved July 22, 2016. ^ Scott Mendelson (July 22, 2016). "'Star Trek Beyond' Box Office: Sci-Fi Sequel Beams Up Strong $5.5 Million Thursday". Forbes. Archived from the original on July 23, 2016. Retrieved July 22, 2016. ^ Dave McNarry (July 22, 2016). "Box Office: 'Star Trek Beyond' Blasts Off With $5.5 Million on Thursday". Variety. Archived from the original on July 23, 2016. Retrieved July 22, 2016. ^ Anita Busch (July 22, 2016). "'Star Trek Beyond' Eyes $57.5M-$60M Frame, 'Ice Age: Collision Course' Tepid, 'Lights Out' Turns It Way Up – B.O. Update". Deadline Hollywood. Archived from the original on April 29, 2017. Retrieved July 23, 2016. ^ Scott Mendelson (July 23, 2016). "Box Office: 'Star Trek Beyond' Nets $22.5M Friday For Possible $60M Weekend". Forbes. Archived from the original on July 24, 2016. Retrieved July 23, 2016. ^ Scott Mendelson (July 24, 2016). "'Star Trek Beyond' Box Office: When A $59 Million Weekend Is Just 'Okay'". Forbes. Archived from the original on July 25, 2016. Retrieved July 24, 2016. ^ Anthony D'Alessandro, Anita Busch (July 24, 2016). "'Star Trek Beyond' Launches To $59.6M, Third Best Debut In The Series – Sunday Update". Deadline Hollywood. Archived from the original on April 29, 2017. Retrieved July 24, 2016. ^ Pamela McClintock (July 24, 2016). "Box Office: 'Star Trek Beyond' Beams Up $59.6M; 'Ice Age 5' Bombs With $21M". The Hollywood Reporter. Archived from the original on July 24, 2016. Retrieved July 24, 2016. ^ Bryan Alexander (July 25, 2016). "'Star Trek Beyond' boldly goes to $59.6M at box office". USA Today. Archived from the original on July 26, 2016. Retrieved July 26, 2016. ^ Scott Mendelson (July 30, 2016). "Friday Box Office: 'Star Trek' Plunges 69%, 'Ghostbusters' Topping $100M". Forbes. Archived from the original on July 31, 2016. Retrieved July 31, 2016. ^ Scott Mendelson (August 6, 2016). "Friday Box Office: 'Jason Bourne' Plunges 71% As 'Star Trek Beyond' Continues Freefall". Forbes. Archived from the original on August 6, 2016. Retrieved August 7, 2016. ^ a b Nancy Tartaglione (July 31, 2016). "'Jason Bourne' Supreme With $50.1M Bow & Franchise Records – Intl Box Office Update". Deadline Hollywood. Archived from the original on August 1, 2016. Retrieved August 1, 2016. ^ a b c d Nancy Tartaglione (September 4, 2016). "'Star Trek Beyond' Beams Into China With $31.3M Bow; 'Pets' Woofs It Past $750M WW -International Box Office". Deadline Hollywood. Archived from the original on September 5, 2016. Retrieved September 5, 2016. ^ a b Anita Busch (September 13, 2016). "'Sully' Flies Higher In Offshore Debut; 'Suicide Squad' Squashes $700M WW – International Box Office Final". Deadline Hollywood. Archived from the original on August 8, 2017. Retrieved September 14, 2016. ^ Nancy Tartaglione (August 21, 2016). "'Pets' Pushes 'Suicide Squad' From #1 Offshore Perch, Collars $675M WW; Supervillains Gain On $600M – Intl B.O." Deadline Hollywood. Archived from the original on August 22, 2016. Retrieved August 22, 2016. ^ Charles Gant (July 26, 2016). "The BFG towers over UK box office while Star Trek Beyond fails to prosper". The Guardian. Archived from the original on July 27, 2016. Retrieved July 26, 2016. ^ Scott Mendelson (September 2, 2016). "Box Office: 'Star Trek Beyond' Blasts Off In China With $9.3 Million Opening Day". Forbes. Archived from the original on September 3, 2016. Retrieved September 3, 2016. ^ Scott Mendelson (September 3, 2016). "Friday Box Office: 'Suicide Squad' Tops 'Man Of Steel,' 'Bad Moms' Passes $100M". Forbes. Archived from the original on September 4, 2016. Retrieved September 4, 2016. ^ Scott Mendelson (September 4, 2016). "Box Office: 'Don't Breathe' Tops, 'Suicide Squad' Near $300M, 'Star Trek Beyond' Nabs $30M In China". Forbes. Archived from the original on September 5, 2016. Retrieved September 4, 2016. ^ a b Patrick Frater (September 4, 2016). "China Box Office: 'Star Trek Beyond' Leads Quiet Weekend". Variety. Archived from the original on September 5, 2016. Retrieved September 5, 2016. ^ Patrick Brzeski (September 11, 2016). "China Box Office: 'Star Trek Beyond' Wins Slow Second Weekend With Just $11.3M". The Hollywood Reporter. Archived from the original on September 13, 2016. Retrieved September 12, 2016. ^ Patrick Frater (September 11, 2016). "China Box Office: 'Star Trek' Wins as Weekend Takings Crater". Variety. Archived from the original on September 12, 2016. Retrieved September 12, 2016. ^ a b Jonathan Papish (September 13, 2016). "China Box Office: 'Star Trek' Goes 'Beyond' for a Second Week". China Film Insider. Archived from the original on September 13, 2016. Retrieved September 13, 2016. ^ Jessica Meyers (September 26, 2016). "Chinese movies cement control of China box office". Los Angeles Times. Archived from the original on September 27, 2016. Retrieved September 27, 2016. ^ Nancy Tartaglione (September 25, 2016). "'Bridget Jones's Baby' Tops Overseas Again As 'Magnificent 7' Corrals $19.2M & 'Storks' Bundles $18.3M – Intl Box Office". Deadline Hollywood. Archived from the original on August 9, 2017. Retrieved September 26, 2016. ^ Jonathan Papish (September 2, 2016). "China On Screen: Paramount 'Trek' Promo Campaign Reaches for the Stars". China Film Insider. Archived from the original on September 2, 2016. Retrieved September 3, 2016. ^ Scott Mendelson (September 5, 2016). "Box Office: China Can't Turn A Flop Into A Blockbuster". Forbes. Archived from the original on September 5, 2016. Retrieved September 5, 2016. ^ "Star Trek Beyond (2016)". Rotten Tomatoes. Fandango Media. Archived from the original on October 8, 2018. Retrieved November 12, 2018. ^ "Star Trek Beyond Reviews". Metacritic. CBS Interactive. Archived from the original on July 16, 2016. Retrieved November 12, 2018. ^ Roeper, Richard (July 18, 2016). "'Star Trek Beyond' ranks with the better, lighter franchise films". Chicago Sun-Times. Archived from the original on July 24, 2016. Retrieved July 29, 2016. ^ Collura, Scott (July 15, 2016). "The voyage home". IGN. Archived from the original on August 1, 2016. Retrieved July 29, 2016. ^ Rooney, David (July 15, 2016). "Director Justin Lin assumes command from J.J. Abrams on this third installment of the sci-fi series reboot, which pits the Enterprise crew against a brutal Idris Elba". The Hollywood Reporter. Archived from the original on July 18, 2016. Retrieved July 30, 2016. ^ Gleiberman, Owen (July 15, 2016). "Director Justin Lin brings his bravura action energy and a certain nostalgic flair to the 'Star Trek' series, even as he unboldly goes where too many have gone before". Variety. Archived from the original on July 27, 2016. Retrieved July 29, 2016. ^ Hugues, Mark (July 21, 2016). "Review: 'Star Trek Beyond' Is Smart, Funny Sci-Fi Action-Adventure". Forbes. Archived from the original on July 29, 2016. Retrieved August 3, 2016. ^ Smith, Kyle (July 21, 2016). "For the love of God, stop making 'Star Trek' movies". New York Post. Archived from the original on July 26, 2016. Retrieved July 29, 2016. ^ Berardinelli, James (July 22, 2016). "Star Trek Beyond (United States, 2016)". Reelviews. Archived from the original on July 25, 2016. Retrieved July 29, 2016. ^ Robinson, Dave (July 22, 2016). "Star Trek Beyond – Film Review – Crash Landed". Crash Landed. Archived from the original on July 24, 2016. Retrieved July 23, 2016. ^ Nashawaty, Chris (July 15, 2016). "Star Trek Beyond: EW review". Entertainment Weekly. Archived from the original on July 25, 2016. Retrieved July 30, 2016. ^ "La La Land Leads with 12 Nominations for the 22nd Annual Critics' Choice Awards". Critics' Choice. December 1, 2016. Archived from the original on June 7, 2017. Retrieved December 1, 2016. ^ Pape, Danny (February 7, 2017). "Star Wars: Rogue One Leads Empire Awards 2017 Nominations". Flickreel.com. Archived from the original on March 3, 2017. Retrieved March 3, 2017. ^ "GLAAD Media Awards Nominees #glaadawards". GLAAD. Archived from the original on January 31, 2016. Retrieved February 1, 2017. ^ "Golden Tomato Awards - Best of 2016". Rotten Tomatoes. January 12, 2017. Archived from the original on August 30, 2017. Retrieved January 13, 2018. ^ "The 17th Annual Golden Trailer Award Nominees". GoldenTrailer.com. Archived from the original on April 11, 2016. Retrieved April 10, 2016. ^ "Justin Timberlake & Alexandre Desplat Among Winners At Hollywood Music In Media Awards". Deadline. November 18, 2016. Archived from the original on November 19, 2016. Retrieved November 18, 2016. ^ McNary, Dave (November 2, 2016). "'La La Land' Scores Three Hollywood Music in Media Nominations". Variety. Archived from the original on November 3, 2016. Retrieved November 3, 2016. ^ "The Jupiter Awards 2017". Jupiter Awards. Archived from the original on January 20, 2017. Retrieved December 26, 2016. ^ "Kids' Choice Awards 2017: The Winners List". March 3, 2017. Archived from the original on August 9, 2017. Retrieved June 12, 2017. ^ Petski, Denise (January 11, 2017). "'Fantastic Beasts', 'La La Land' Among Make-Up Artists & Hair Stylists Guild Awards Nominees". Deadline. Archived from the original on January 12, 2017. Retrieved January 11, 2017. ^ McNary, Dave (March 2, 2017). "Saturn Awards Nominations 2017: 'Rogue One,' 'Walking Dead' Lead". Variety. Archived from the original on March 3, 2017. Retrieved March 3, 2017. ^ Giardina, Carolyn (January 10, 2016). "'Rogue One' Leads Visual Effects Society Feature Competition With 7 Nominations As 'Doctor Strange,' 'Jungle Book' Grab 6 Each". Hollywood Reporter. Archived from the original on January 12, 2017. Retrieved January 10, 2016. ^ Kit, Borys (June 26, 2015). "'Star Trek 3' Stars Score Big Raises as Kirk and Spock for Fourth Movie (Exclusive)". The Hollywood Reporter. Prometheus Global Media. Archived from the original on June 27, 2015. Retrieved June 27, 2015. ^ Chitwood, Adam (July 15, 2016). "Is Chris Hemsworth Returning for 'Star Trek 4'? J.J. Abrams Teases Next Sequel". Collider.com. Archived from the original on July 17, 2016. Retrieved July 16, 2016. ^ Chitwood, Adam (July 18, 2016). "Fourth 'Star Trek' Movie A Go At Paramount; Chris Hemsworth Back As Kirk's Father". Deadline Hollywood. Archived from the original on July 19, 2016. Retrieved July 18, 2016. ^ "Star Trek 4 is Officially a Go; Synopsis & Writers Revealed". July 18, 2016. Archived from the original on July 20, 2016. Retrieved July 18, 2016. ^ Slotek, Jim (July 13, 2016). "J.J. Abrams: 'Star Trek' won't replace Anton Yelchin". Toronto Sun. Archived from the original on July 16, 2016. Retrieved July 22, 2016. ^ Fleming, Mike (December 3, 2017). "Quentin Tarantino Hatches 'Star Trek' Movie Idea; Paramount, JJ Abrams To Assemble Writers Room". Deadline Hollywood. Archived from the original on December 5, 2017. Retrieved December 5, 2017. ^ Fleming, Mike (December 22, 2017). "Quentin Tarantino 'Star Trek' Firms 'The Revenant's Mark L. Smith As Screenwriter". Deadline Hollywood. Archived from the original on December 22, 2017. Retrieved December 22, 2017. ^ IGN News (April 26, 2018). "STAR TREK: PARAMOUNT DEVELOPING TWO MOVIES". IGN. Archived from the original on April 27, 2018. Retrieved April 26, 2018. ^ Justin Kroll (April 26, 2018). "'Star Trek 4': S.J. Clarkson Becomes the First Female Director in Franchise's History (EXCLUSIVE)". Variety. Archived from the original on June 18, 2018. Retrieved June 19, 2018. ^ Kit, Borys (August 10, 2018). "Chris Pine and Chris Hemsworth 'Star Trek 4' Future In Doubt as Talks Fall Through (Exclusive)". Hollywood Reporter. Archived from the original on August 11, 2018. Retrieved August 11, 2018. ^ Saddler, Jack (January 10, 2019). "Star Trek 4 'cancelled indefinitely'". The Independent. Retrieved January 11, 2019.